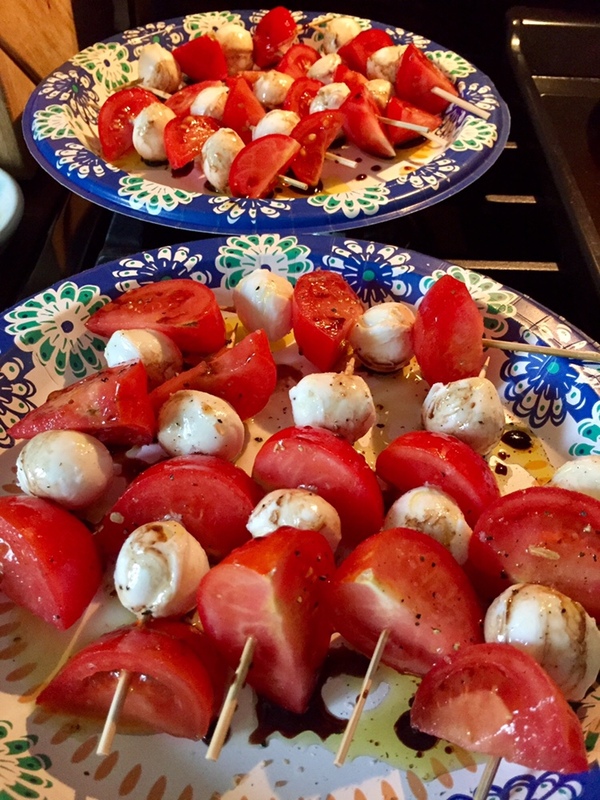 “It’s like a gourmet restaurant,” Mama proclaimed today, after I brought her this dish of Caprese skewers, featuring luscious tomatoes from our garden and our favorite Balsamic vinegar. Please don’t misunderstand. Yesterday, we ate drive-thru burgers and frozen yogurt. Today we had a wee gastronomic adventure at home. I like to think of it as balance. Anyway, this scrumptious and colorful snack came on the heels of fresh whipped cream with breakfast. And then we enjoyed roasted potatoes, grilled zucchini, and Bloody Mary-marinated hangar steak, hot off the grill, for dinner. Today’s #OneGoodThing was a gourmet food day at home with Mama! Day 212 of 365. And Day 943 in a row (here’s the first 366 & the following 365)! 6 years ago today: My Amazing, Memorable Mama and Buon Viaggio Celebration… Planning Underway!